Just after 3:00 pm Friday August 25, 2017 we took an Uber to Dulles Airport. I had the gel pack from the iCool frozen solid and put that in a small Rubbermaid lunch bag with 2 thin ice packs, 1 on top and 1 on the bottom. If you don’t want to read all the way to the end, this system kept the growth hormone cold for the 20 hours going and returning but the 2 thin blocks had completely thawed. The inner iCool was mostly frozen and the growth hormone was still cool. I had the sharps separately in a little square container with just enough for the week.I used the side pocket of the lunch bag to store my doctor’s note and clipped the whole thing with a carabiner to my backpack. Our first flight out of Dulles there was a lot of turbulence over the ocean. Possibly due to Hurricane Harvey. Apparently, they flew faster to get out of the turbulence and we landed early in London Saturday morning. We walked for what seemed like forever to get to Customs. Then, since we were coming from outside the UK we had to leave security area and go through TSA again. The next plane to Inverness was announced at 9:00 am (Saturday morning) so we moved to that gate. Tom went to the restroom. Turns out that gate was actually down an elevator. I texted Tom that we had to move along. Then they said the flight was closing. Another text to Tom. He arrived and we hustled down 2 escalators and onto a bus that said “Final Passengers”. We were among the last people on the small plane. We had to walk up stairs to get on the plane, then back down when we arrived. I could already feel my knee hurting. There was no turbulence on the short flight, though. We arrived in cold/rain. Of course. The luggage arrived and we got our rental car and headed off. We saw lots of sheep, of course. We arrived in Aviemore and saw lots of bikers. This is their answer to Sturgis, I guess. 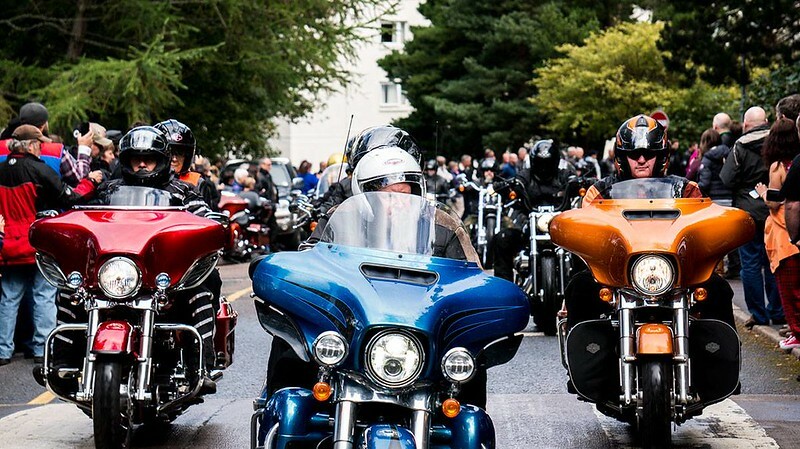 Thunder in the Glens has become one of the major events in the UK for Harley-Davidson fans, with people traveling from all over the world to enjoy the event. It is now officially the largest Harley Davidson rally in the UK with an ever growing number of loyal fans. Enjoy over 60 trade stands supporting local charities and groups, H-D demo bike rides, Jeep demo drives, Custom bike show, Outside entertainment, Scottish Knights battle scenes, Off road motorbike riding. We arrived at our place. Luckily, we knew where it was because we’d been here before. According to RCI (the timeshare company that got us this place, it’s called Macdonald Craigellachie Chalets. According to the place, it’s called Macdonald Spey Valley Golf and Country Club, or Dalfaber Golf and Country Club or Dalfaber Village or…??? We couldn’t check in until 4:00 pm so we had a bite to eat while we waited. I had Scotch broth. I haven’t had that for years and years – yummy! 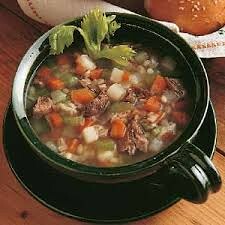 Scotch broth is a filling soup, originating in Scotland (DUH!). The principal ingredients are usually barley, stewing or braising cuts of lamb or mutton (hopefully not relatives of those sheep we saw earlier), root vegetables (such as carrots, swedes [rutabaga], or sometimes turnips [aka neeps]), and dried pulses (legumes, most often split peas and red lentils). Cabbage and leeks are often added shortly before serving to preserve their texture, color and flavors. The club room had a Snooker table. I didn’t know what snooker was, although the table looks like a pool table. It sounds quite complicated according to Wikipedia. We finally got the key and started driving around trying to find our chalet. Then we went back to main desk for better directions and finally found it. Then, the usual unpacking, charging electronics, short naps. Then off to Tesco for some grocery shopping. The streets were crowded with bikers, drinks in hand, oblivious to traffic. There was a long queue in the grocery near their customer toilets. Lots of folks wandering around the store, not necessarily with any items in their carts. Coconut rum and tropical juice (orange, apple, pineapple, pomegranate, banana, and mango) makes an interestingly passable drink. I didn’t read my Kindle at all first night. Instant sleep!